Welcome back to Satisfaction for Insatiable Readers...the place to be when burning the midnight oil means you've worked all day and are reading/blogging into the night. Who needs sleep, right? First things first, that cover! Millie was definitely an unexpected breath of fresh air, herself. In her tendencies and curiosity, she reminded me of the BOOV from the movie Home. Her speech patterns reflected their culture as well, but it just made her THAT much cuter, that much more human, even if she technically isn't. Her lack of "fitting the in" within her group made the matchup with Alice that much easier, that much more realistic. When her simple desire to not miss her favorite TV show turned into something close to disaster, I worried for her. As her desire grew to know more and more about the No-Fur world, I was biting my nails that she wouldn't be found out. When some unexpected exposure came to her, I was sweating bullets...but I should have known these two friends would work things out. No matter the obstacles standing in our path, it's always easier to conquer them with a friend by our side. Overall, I found it to be a heartwarming tale that reminds us that while bullying is real, so is acceptance, friendship, kindness, and understanding. It's our difference that make us who we are, and who we are is REMARKABLE. Let Alice and Millie's story warm your soul, but don't get too comfy though because I've a feeling these friends aren't out of the woods quite yet (literally and figuratively). Who the hay was that on the phone? What do they want with the Yare and why? Better still, will Jeremy actually HELP this mystery person? (I feel like Millie with a million questions!) Very curious to see what book 2 in the series will bring us, but you best believe I'll have a spot open on my wish list for it. Recommended read for Middle Grade readers and beyond. There's not a person out there that can't use a dose of "believe in yourself" and "let your true self shine" every now and then. Jennifer Weiner is the #1 New York Times bestselling author of fourteen books, including Good in Bed, In Her Shoes, which was made into a major motion picture, and Who Do You Love. A graduate of Princeton University and contributor to the New York Times Opinion section, Jennifer lives with her family in Philadelphia. Visit her online at JenniferWeiner.com. 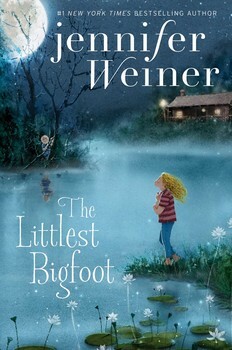 Special thanks to Jodie at Simon & Schuster Children's Publishing for the copy for review. (THANKS!) For more information on this title, the author, or the publisher, feel free to click through the links provided above. This title is set to release 09/13/16 via Aladdin, an imprint of Simon & Schuster, so mark your calendar or pre-order your copy today!